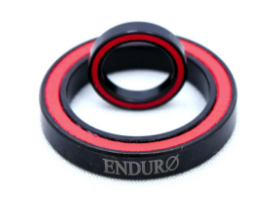 About Bicycle Bearings - in particular reference to Enduro Brand Bearings. Bearings are rated in two distinct ways: ABEC and Ball Grade. ABEC - The higer the number the better. The ABEC standards rating system includes grades 1,3,5,7, and 9. The higher the ABEC rating, the tighter the tolerances are, making the bearing a more precision part. To meet ABEC standards, the bearing design must pass all tests, which include noise testing at high RPM, extremely close tolerances for I.D. and O.D., roundness of ball, trueness of the races and micro surface finishes of balls and races. Most high quality bicycle bearings are made to ABEC 3 or 5 standard. Higher ratings are suited for high speed applications such as turbo's! Ball Grade - The lower the better. Ball grade is a measurement of the roundness (how perfect) of the ball. This is the single most important rating of a bicycle bearing. If you buy a bearing based on 1 rating or spec, ball grade would be it. Race quality, grease, seal performance & retainer type would follow that in terms of what impacts the speed of a bearing. Steel: Grade 300, Grade 100, Grade 25 (commonly used by Shimano), 10. Ceramic vs Steel Balls: Say you had a grade 3 steel ball (even though they don't make them that high of a grade) and a grade 3 ceramic ball. While similarly round, the ceramic still has the edge in hardness and durability. The ceramic ball will not deform, flat-spot, crack, wear out and most importantly, will not create heat (friction, very bad!). The steel ball will! Not to mention the ceramic ball will clean the bearing race with use, making the bearing faster and much more durable! How do I know what bearing I am looking for?